A trip anywhere really isn’t complete without the four-legged members of our family tagging along for the ride. However, travelling with your pet requires a little more consideration than loading your dog in the car and driving off into the sunset. 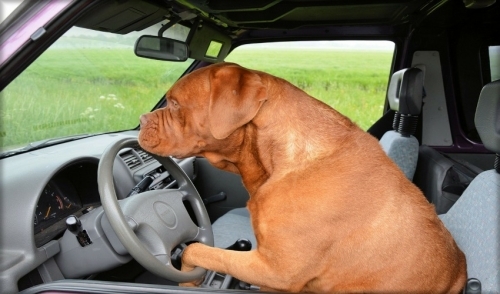 Here are some tips to make sure you and your dog have a safe and smooth ride. First, if it’s a long trip make sure your pet is safe and secure in a well-ventilated part of the car. This doesn’t mean you have to crate your dog, but make sure your animal has room to lie down and turn around. I recommend keeping all the dogs in the backseat of the car. Keeping dogs in the front seat can cause serious harm if you’re ever in an accident. To avoid this, always travel with your animal behind you. Nothing scares me more than seeing drivers with their dogs in their laps. If an airbag deploys between you and the dog, you’re both in for a lot of trouble. When taking a long trip, always feed your dog a few hours before departure. Any experienced dog owner knows how sensitive the digestive system of a dog is. Never feed your dog in a moving vehicle to avoid accidents inside your vehicle. Another important tip is to always make sure you have a travel kit for your dog. This should include food, a bowl, a leash, waste bags, grooming supplies, and a familiar toy to keep your pet comfortable. When it comes to water, always pack your own. Opt for bottled water or water stored in a jug for those hot days when your pet needs a drink. Avoid using a public faucet as it could result in an upset stomach for your pet. If you’re travelling across state lines with your pet, always keep copies of your pet’s vaccination records. While your dogs’ vaccination history is normally not a problem, it’s always better to be safe than sorry if the issue arises. Some states have certain requirements for domesticated animals in their state. Finally, the last tip is up for debate. Many would argue that you should never allow your pet’s head out of the window. While I do agree to a certain degree, my tip for you is to remain cautious as to where you allow your dog to hang his head out the window. If you’re driving down a busy street in a metropolitan area, then it’s probably better to keep your dog’s head inside the car to avoid flying obstacles that could potentially hurt him. Yet, if you’re driving though the backcountry to go on a hike or if you live in a rural area, then I would suggest that it’s safe to let your dog’s hair fly. Aside from the occasional bug getting caught in its mouth, your dog will be safe. Never leave the house without your dog’s leash and tag and make sure there is always proper air circulation in your car. If you are feeling hot, then your dog is more likely to feel 10 times hotter. If you are travelling by air or sea, follow the specific guidelines of your specific travel provider. Your dogs’ safety should always be your number one priority. Follow these simple tips to make sure your dogs’ travel is always safe and enjoyable for the both of you.